Erythronium - plant, care and cultivars. 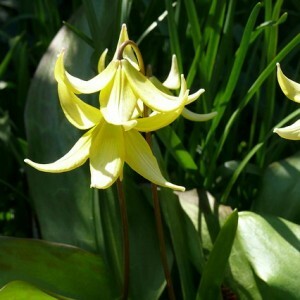 Erythronium - species, types and varieties. Erythronium, sometimes called by Eritronium, is a sort of grassy decorative bulbous plants from the family of Liliaceae. The Russian name came from the Turkic word "kandyk" meaning "dog tooth". The reason is simple: the sort totals (by the present moment) 29 types, and among them the Adder's-spear dog tooth (Erythronium dens-canis) which bulbs indeed very much are similar the form to dog canines is standard. In total 29 are registered in ecological group of efemeroid — perennials with very short period of vegetation. It is the share of early spring (there are on Earth also autumn efemeroida). After education and maturing of fruits and seeds at the beginning of summer vital processes in these plants stop, and their elevated parts entirely and quickly die off. The underground bodies which saved up a reserve of nutrients don't allow to speak about full death of a plant, and with approach of more favorable period vegetation is developed again. Erythronium cultivation. All about plant.